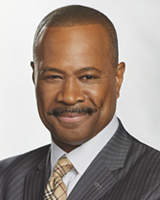 Rick Williams has kept 6abc viewers informed for more than 25 years as an anchor and reporter. For much of that time he has, and continues to, anchor the number-one rated Action News at Noon and Action News at 5pm broadcasts. Rick also reports for Action News' weekly "Crimefighters" series. Before that, Rick co-anchored Action News Mornings, helping to create a dominant early morning program alongside Monica Malpass and Cecily Tynan. Rick arrived in Philadelphia in 1988 from WRAL-TV in Raleigh, North Carolina. Before that, he worked in Huntington, West Virginia and Washington D.C., where he also worked in radio and attended college at Howard University. Although Rick was born in New York, he considers himself a true Philadelphian and has spent much of his time off helping to uplift the community and inspire young people in their academic endeavors. He currently sits on the board of Philadelphia Futures, a non-profit organization that mentors college-bound Philadelphia students. He is also a board member of the Moorestown Theater Company, and has taken the stage in a few musical productions with his family and friends. While Rick has covered a variety of big events and has interviewed various presidents, politicians and celebrities, one of his favorite assignments is hosting the 6abc Thanksgiving Day Parade along with Cecily Tynan every year since 2009. Delivery drivers are being asked to remain extra careful after a pizza deliveryman was shot and killed in Philadelphia earlier this week. A Florida couple in town for less than two hours is hit by tragedy outside their relative's home. A man was found dead inside his car and now authorities are coming to you for help in finding his killer. A father of three young girls is gunned down right outside his own home, now his mother wants answers. Bucks County police want you to identify a school vandal who has hit not once but twice.